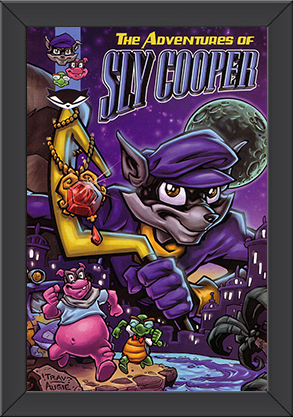 This page serves as a guide for Sly Cooper merchandise, both past and present. The page starts out with a list of items that are currently for sale, official and non-official. It includes product descriptions, the item's original price, the item's rarity, the item's average or fair resale price, and (in some cases) a link to where you can purchase the item second hand. The page also includes related merchandise that would interest Sly Cooper fans, along with archival and preservation information. 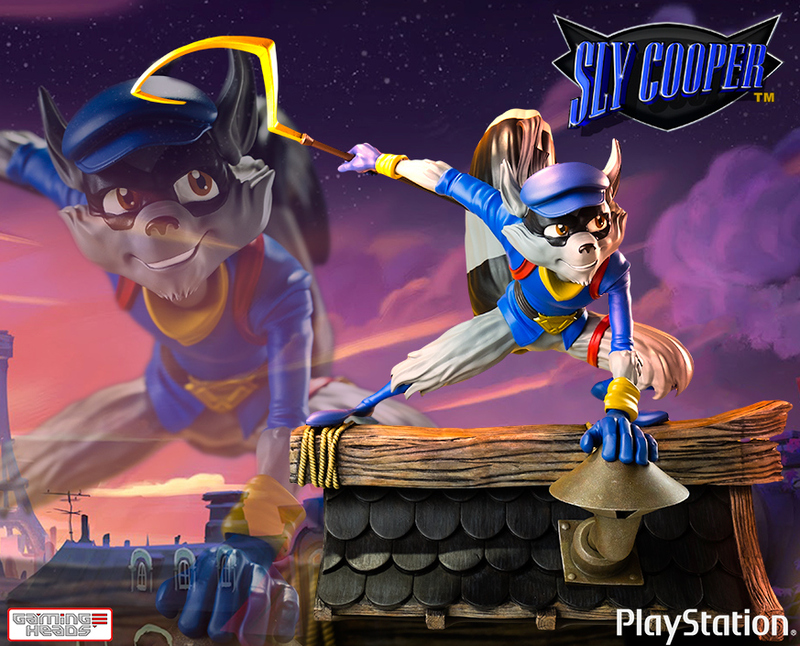 This super cool official Sly Cooper plush recently hit the Playstation Gear Store! Shoutout to VTNVIVI who's video tipped me off to this development. It is very possible that the existence of this plush indicates that the release or announcement of the Sly Cooper Movie or Sly Cooper 5 may be approaching, perhaps even as soon as E3 2017. Read the full news article regarding those conspiracy theories here. ​You can buy one here. "Gaming heads is proud to present Sly Cooper, from Sucker Punch's excellent Sly Cooper series on the PlayStation 2! Sly is portrayed perched on a rooftop holding onto his famous family cane, looking around knowingly as he keeps watch for any patrols who may be on the hunt for him. The statue is cast in high quality polystone to capture every detail of Sly perfectly, then painted by hand to exacting standards. To the top of Sly's cane, the statue measures 12 inches tall." This awesome album, available for digital download on iTunes, features a whole 55 songs, each of which either appeared in Sly Cooper: Thieves in Time or was inspired by it. 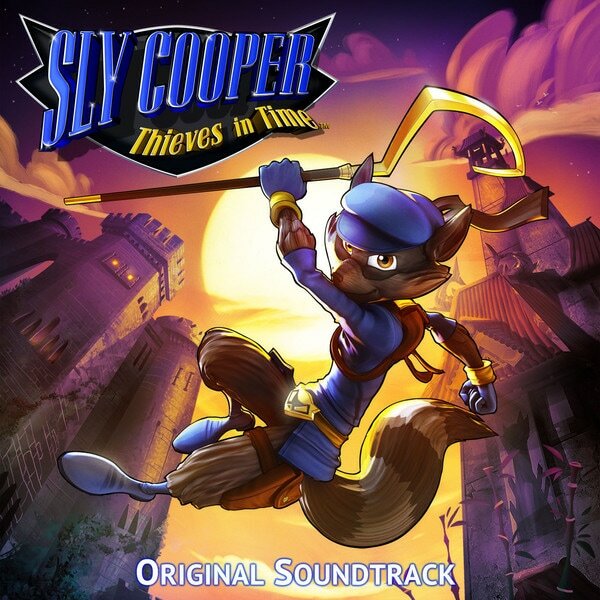 The songs were composed by Peter McConnell, the man behind the music in Sly Cooper since Sly 2: Band of Thieves. This stuff isn't officially licensed, Sony approved Sly Cooper merchandise. However, its still pretty cool and readily available for purchase. I'll provide links for ordering here as well. If you have any suggestions that I should add, let me know! Also, be sure to tell me if an item is no longer being sold - this may happen due to the third-party sellers. While these aren't officially licensed items, they're pretty cool and deserve to get mentioned. 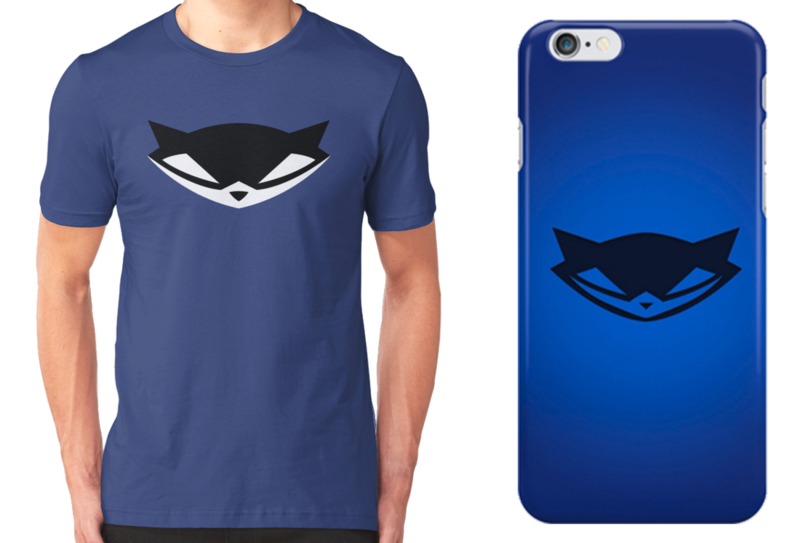 The website RedBubble offers hundereds of Sly Cooper t-shirt designs and multiple iPhone case designs. The cases come for a variety of different iPhone versions, including, the 6s, 6s Plus, 6, 6 Plus, 5s/5, 5c, and 4s/4. This looks a lot like the patch on the inFamous 2 Hero Edition Backpack. Anyway, you can find it at a variety of outlets, all of which I'll link to here. "We are make to order, so please make sure what you get before you buy it. You will get what you see from the photos in our shop. Material: PVC plate, a kind of mixed material looks like wood Length: 140cm, about 55"
There are a ton of these on eBay and Amazon. They look cool but I cannot accurately speak to their quality. They come from China so shipping is steep. 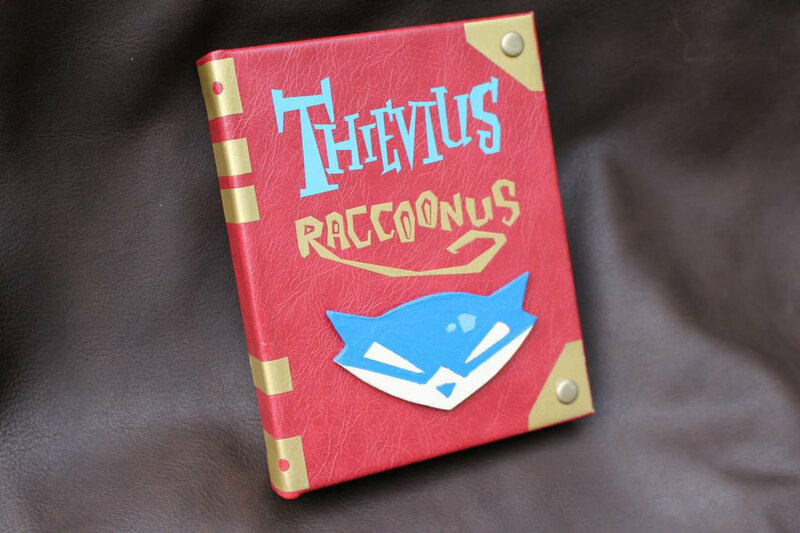 This cool reproduction Thievius Raccoonus can come as an eReader / Kindle / iPad / Tablet Cover, or as a sketchbook or journal. For some reason there's two listings on Etsy, so I'll link to both here. 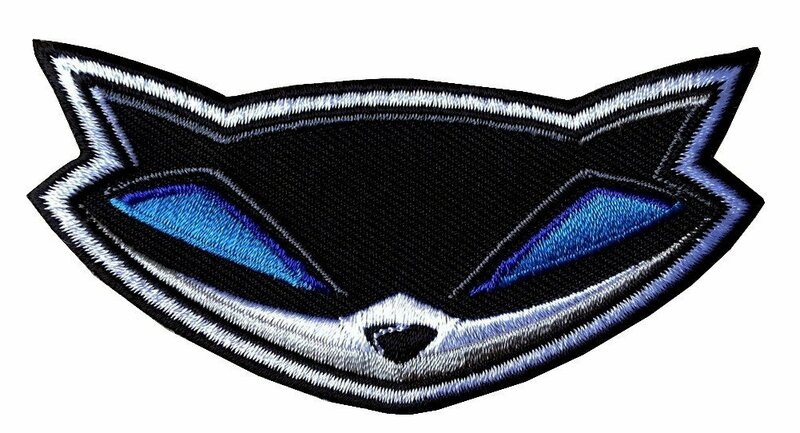 Here's a collection of the Sly Cooper merchandise that used to be sold on Sucker Punch Production's online store before it closed, or elsewhere on the Internet. This stuff is also pretty rare, but you can occasionally find some of it on Amazon or eBay. If you manage to locate one of these and would like to sell it, please PLEASE contact me! 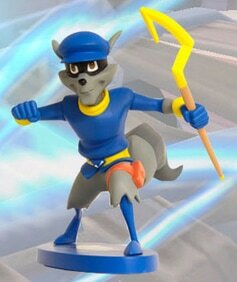 "Finally, the item everyone has been waiting for... the elusive Sly Cooper figurine. Sly Cooper is captured in a 6" tall figurine made of high quality resin. The 6" base provides the stability to capture Sly in one of his action poses. Parts are non-moving but the cane can be removed. Only 150 figurines will be made available for sale through our online store... with portions of the proceeds going to Child's Play www.childsplaycharity.org/ and other children's charities." Finding one of these is every Sly collector's dream, but they are extremely rare. One can be seen hanging out in Sucker Punch Productions' studio on occasion. 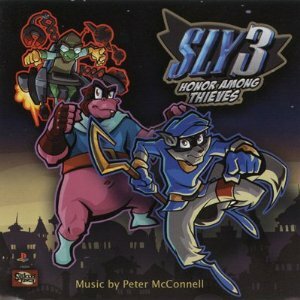 "The one item (other than the figurine) that everyone has been asking for has been the soundtrack CD to Sly 3: Honor Among Thieves. Well... here you have it. 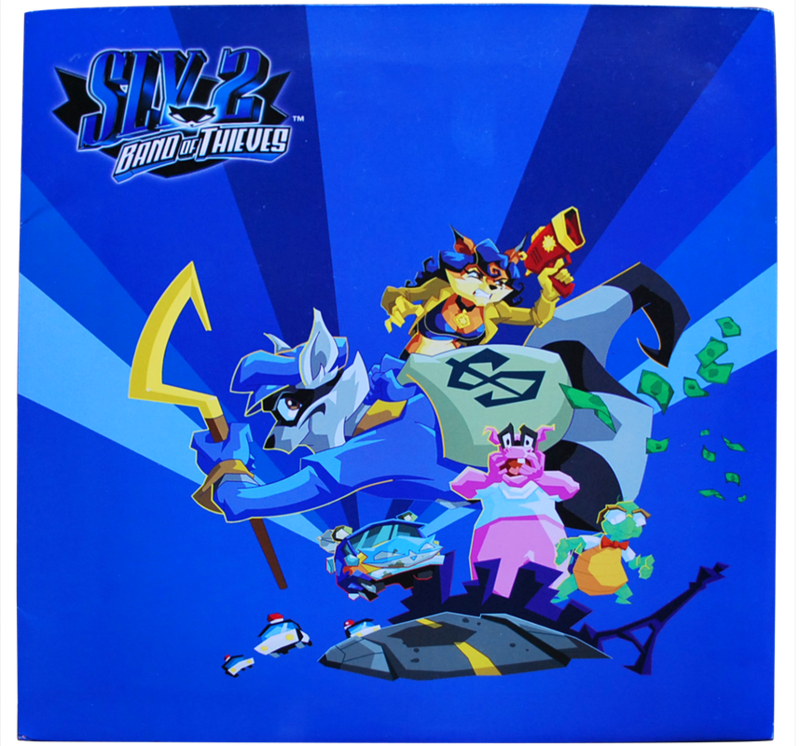 The song list includes a few bonus tracks from Sly 2: Band of Thieves as well. They've been remixed and re-mastered by Maestro Peter McConnell for your listening pleasure. The soundtrack captures all the emotion and story from our game and is sure to be enjoyed. For the list of tracks... make sure to check out the additional product pics!" You can find this available for resale on Amazon here. "Enjoy your favorite characters, Sly Cooper, Bentley and Murray featured on a double sided holiday ornament. The precision cut acrylic character ornament measures approximately 1/4" thick, 2"x3" rectangle. 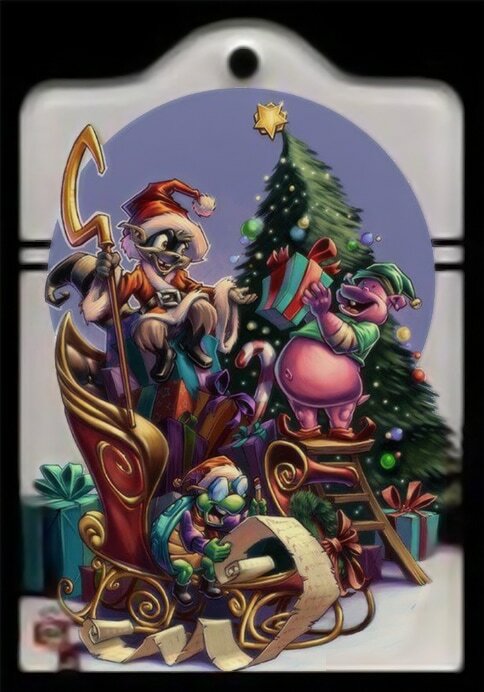 The original artwork by Augie Pagan (see his profile in our company, about us page) is featured on both sides of the ornament, which is perfect for hanging on the family tree.​"
Sucker Punch Productions made this Sly Cooper Christmas tree ornament featuring the gang ready to deliver presents... probably stolen. This is no longer sold officially and it is extremely rare to find one second hand. 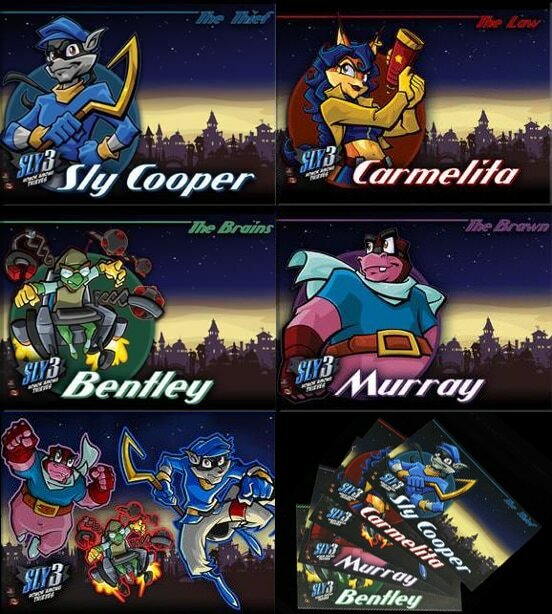 "Sly Cooper and the gang postcard set - two postcards each of five character designs, digitally printed on 100# HP indigo glossy paper in high end color and shrink wrapped for easy delivery. Send them to a friend or tape them inside your locker. The postcards are a favorite of Juliet Johanson, her 5 year-old daughter gave a few out at school." Practically nothing is known about this item. These mugs were probably never intended for mass distribution were simply a promotional item at the studio or conventions. This item is considered to be ultra-rare and you'll likely never come across one. The only other reference on the internet can be found over at Verona: Online. "Each character magnet is sold separately. Collect all five designs to complete your set of uniquely shaped character magnets with colorful graphics featuring each character or a group shot. The precision cut acrylic magnets are about 1/4" thick, which gives the magnet a premium feel and can easily be displayed on any metal surface. 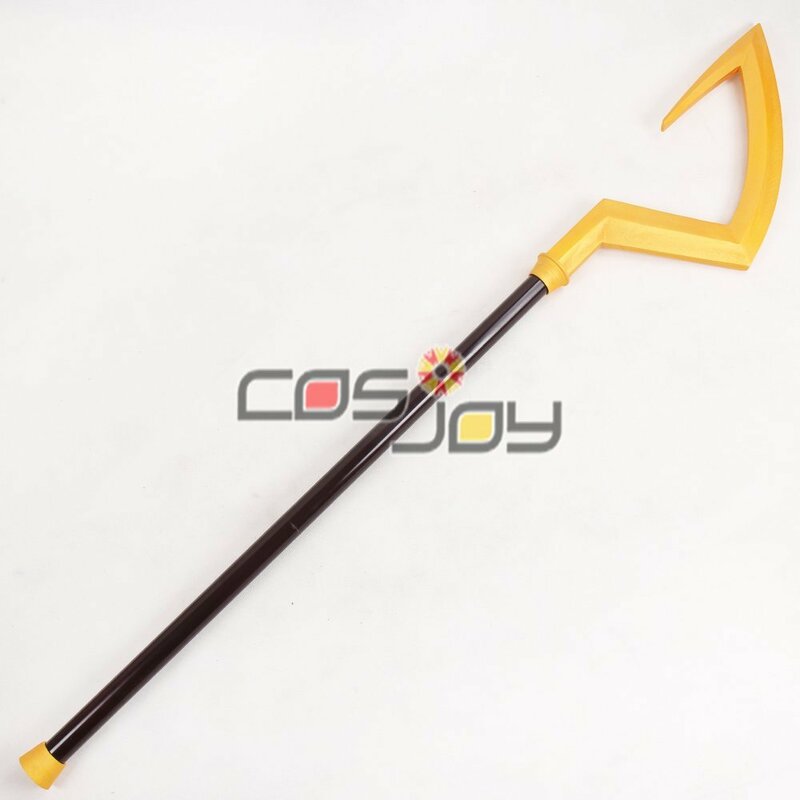 Dimensions are approximately 2.25" x 2.75 The Sucker Punch staff has been buying magnets since the opening of the store... easily making them the most popular items. " "Enjoy your favorite character, Sly Cooper, on a multi-use zipper pull. The precision cut acrylic character zipper pull measures approximately 1/8" thick, 1.5" rectangle. The perfect accessory for backpacks, clothing or other personal items. Edward Pun, whose been known to create artwork around here, has two kids who thought it was fun to have the zipper pull on their back backs." This is a rare item but occasionally shows up on eBay or Amazon. You can read the comic online here. ​You can download the comic here. 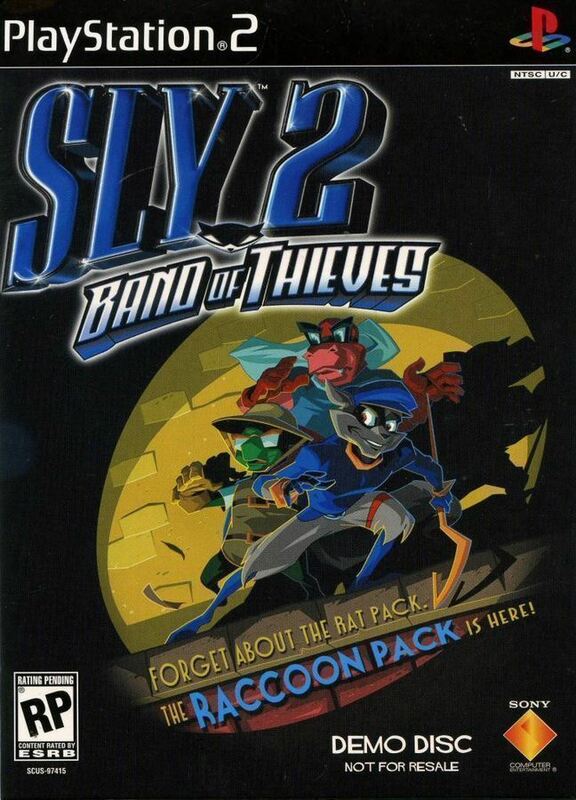 "Sly and the gang go on their second comic adventure in "Old Friends And New Questions" in a story that takes place between Sly 2: Band Of Thieves and Sly 3: Honor Among Thieves. Sly receives a message from a member of his fathers gang. When Sly visits McSweeney in jail, he learns of map that leads to his family fortune. Join Sly as he hunts down the map in order to reclaim the treasure. Written and penned by Travis Kotzebue, Jordan Kotzebue, Augie pagan, Kathy Anderson, Dev Madan, Edward Pun." "When Sly Cooper and his band of master thieves aren't busy "reclaiming" art treasures, they spend their time making fine art of their own. Take a drawing lesson from the "Thievius Raccoonus" in this book full of easy-to-follow, step-by-step instructions and drawing tips. All you'll need are some paper, pencils, pens, markers, and an eye for what makes a piece of art a true masterpiece. You can thank Travis Kotzebue, a Sucker Punch concept artist, for all the final pieces and poses in Scholastic's "How To Draw" book." 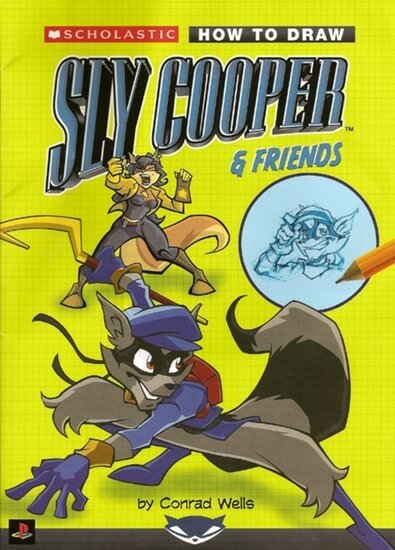 This book was an official strategy guide for Sly Cooper and the Thievius Raccoonus published by Prima Games. These guides are pretty easy to find second-hand hand. However, condition and whether or not the "giant poster" is present significantly affects it's value. The guide features some tips and pretty cool design. You can read the first 50 pages (there are 128 total) over here. "Sly, Bentley and Murray are featured in a sandstone color, short sleeve, screen printed t-shirt by District Threads. The perfect t-shirt styling with instant lived-in feel, smooth washed coloring and top-notch construction. Pigment-dying process provides a unique look and feel that is enhanced with each wash. 6.1-ounce, 100% pigment-dyed cotton with a seamless, double-needle collar. Preshrunk; taped neck and shoulders as well as double-needle sleeves and bottom hem for lasting wear. Art is screen printed in 12 colors. There are no images on the back of the shirt. All the parents here at Sucker Punch Productions like this t-shirt, for it comes in youth sizes perfect for all the kids." "Sly, Bentley and Murray are featured in a smoke/black color, screen printed, 3/4 sleeve jersey by District Threads. An unbeatable combination of two-tone raglan styling and super-soft pigment-washed body with lived-in color treatment. Sewn on reactive-dyed collar and cuffs for a great touch. 6.1 once, 100% pigment-washed cotton body. Preshrunk with double-needle hem for added durablility. Art is screen printed in 12 colors. There are no images on the back of the shirt. Adam Smith, who created the art featured on both the jersey and t-shirt, prefers this shirt, for the artwork really stands out against the dark colored shirt.​"
"Sly mask distressed black logo in a white color, short sleeve, t-shirt by American Apparel. 100% pigment-dyed cotton available in limited quantities and sizes (Adult M, L, XL, 3XL). 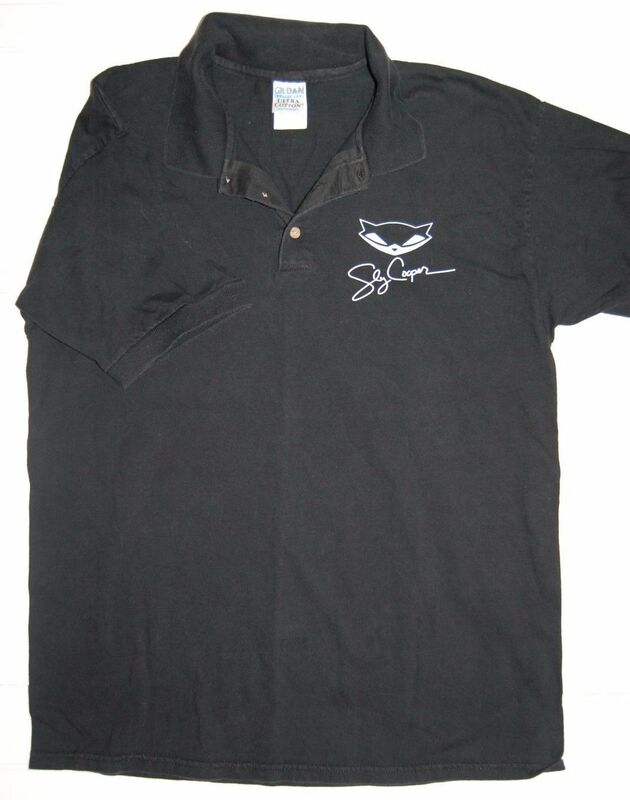 This t-shirt is a favorite of our friends at Sony.​"
Most of the other shirts can occasionally be found on eBay second-hand, but this is undoubtedly the most rare shirt. "The Sucker Punch logo is featured on the left front chest of a chestnut color, short sleeve, screen printed t-shirt by District Threads. The perfect t-shirt styling with instant lived-in feel, smooth washed coloring and top-notch construction. Pigment-dying process provides a unique look and feel that is enhanced with each wash. 6.1-ounce, 100% pigment-dyed cotton with a seamless, double-needle collar. Preshrunk; taped neck and shoulders as well as double-needle sleeves and bottom hem for lasting wear. Art is screen printed. There are no images on the back of the shirt. Brian Fleming, who produced all the Sly games, has been seen wearing this t-shirt around the office on more than one occasion. 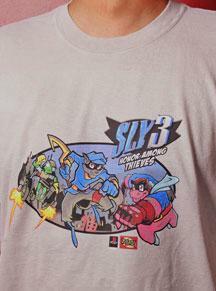 Then again, so has half the office.​"
"A Rare Playstation 2 Sly Cooper Collared T Shirt. Black. Great Condition. Three buttons on front. "PlayStation 2" On back. 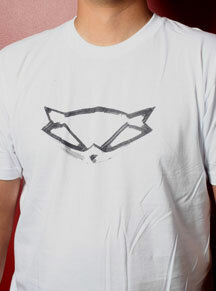 "Sly Cooper" head and 'signature' on front left chest." Not much is known about this particular t-shirt. 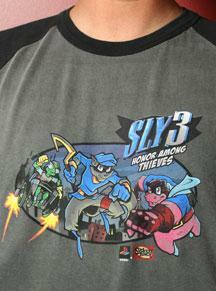 On the front top-right, the shirt sports the Sly Cooper logo along with Sly's signature. The back flaunts a large PlayStation 2 logo. This doesn't seem to have ever been sold on the old Sucker Punch Productions online store. However, it appears to be an official item as it has appeared on other platforms, most notably Verona Online: Sly Cooper. 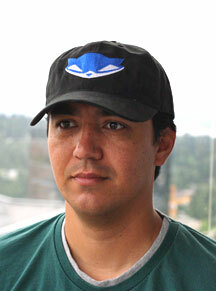 "Sly mask logo is featured in in this 100% cotton baseball cap by Richardson. An all black cap with an embroidered blue logo. The baseball cap has an adjustable strap in the back for fit. The baseball cap was actually added at the last moment. 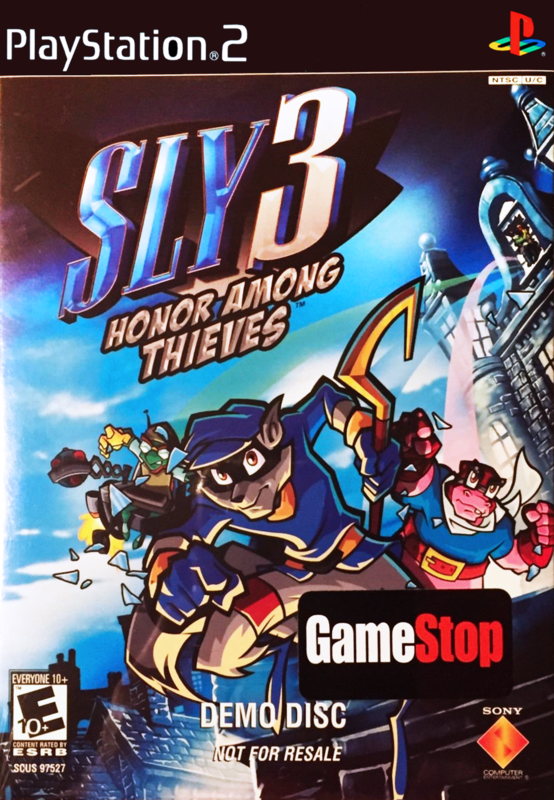 You can thank Bruce Oberg, who also implemented the 3-D feature in Sly 3: Honor Among Thieves." 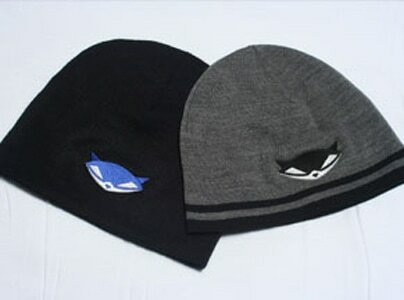 "Sly mask logo is featured in two different skull caps by Port & Company. One is grey with black stripes with a black logo, while the other is all black with a blue logo. The skull caps are fine knit and hugs the head perfectly. 100% acrylic fabric provides just the right amount of stretch for a great fit and lasting wear.Gene Blakefield, our resident comic relief, can be seen wearing the skull caps. He's also a person who could use the help keeping his noggin warm." Practically nothing is known about this item. This beanie was probably never intended for mass distribution was simply a promotional item at the studio or conventions. This item is considered to be ultra-rare and you'll likely never come across one. The only other reference on the internet can be found over at Verona: Online. 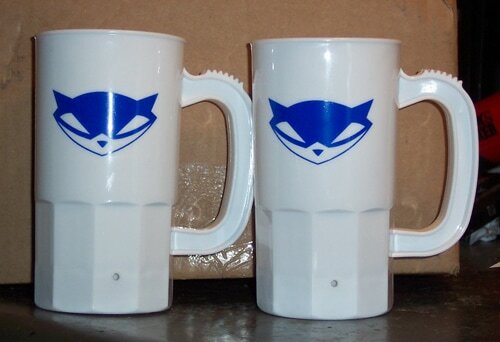 When it comes to Sly Cooper merchandise, it doesn't get any rarer than this. Here's some of the press kits (pre-release packages sent to journalists and other industry insiders that contain game demos and other cool stuff) and promotional items that you'll be hard-pressed to find for sale anywhere on the internet. 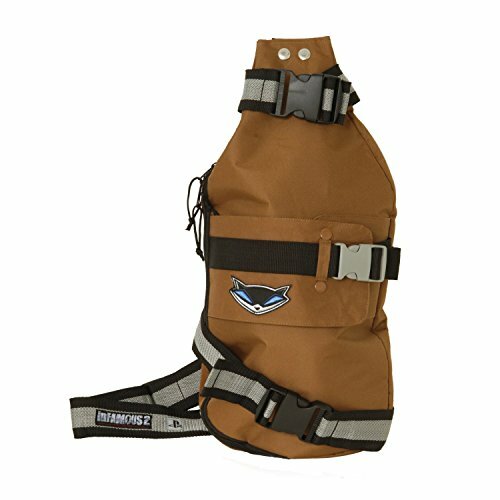 After seeing a low-resolution photo of this backpack on Verona: Online, I did some digging and discovered a post on the PlayStation Forums regarding the item. 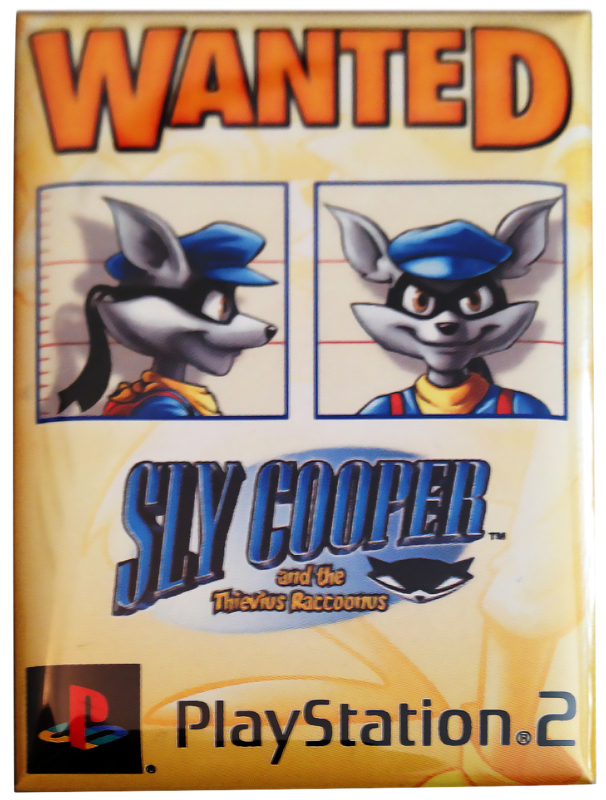 The backpack was distributed as part of the Sly Thief Kit that was awarded to the first 100 people who collected all of the secret codes on the promotional website when Sly Cooper and the Thievius Raccoonus was released. You can get a much more in-depth look at the press kit in this awesome video by Game Loot over here. This was a pin/button for Sly Cooper and the Thievius Raccoonus. It was likely included in a press kit or distributed at a convention like E3, but that is purely speculation. Nothing is really known about this item, except for the fact that one surfaced on eBay a while back. This is considered to be extremely rare and would likely command a hefty price. 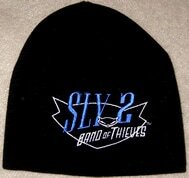 This was the press kit for Sly 2: Band of Thieves. This just appears to be a disc sleeve for a PS2 game disc. 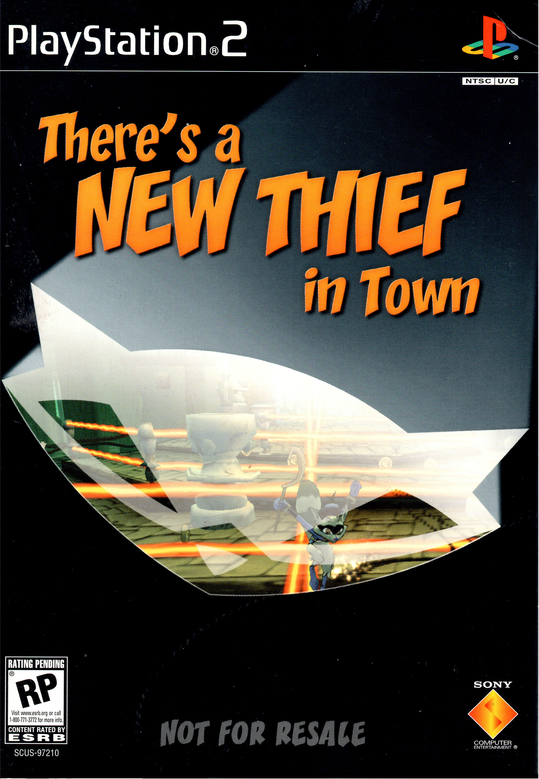 Not to be confused with the Sly 2: Band of Thieves demo disc, this was probably the full game in its near-completed form. However, this is all mostly speculation as little is really known about this item, except for the fact that one surfaced on eBay a while back. This is considered to be extremely rare and would likely command a hefty price. When this image was first leaked by an employee at Sony, people concluded that it must be part of a collectors edition for Sly Cooper: Thieves in Time. Unfortunately, we were wrong. It is unknown how many of these exist, but one can frequently be seen floating around Sucker Punch Production's studios, as seen from photos on their Twitter page. 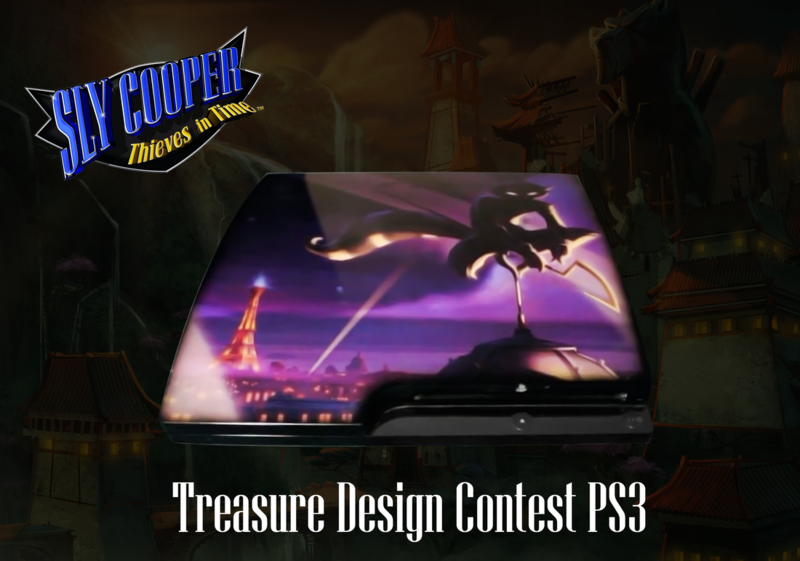 This Sly Cooper themed PlayStation 3 was given to the two winners in the Sly Cooper: Thieves in Time treasure design contest ran by Sanzaru Games back in 2012. You can see the video where CEO Glen Egan talks about the contest here. A user on YouTube recently bought one of them second-hand and posted a video discussing it and showing it off here. While these items aren't technically Sly Cooper merchandise, they are related to the series in some way, whether they be Sony, PlayStation, inFamous, or Sucker Punch related... and they're just pretty cool, after all. More coming soon! 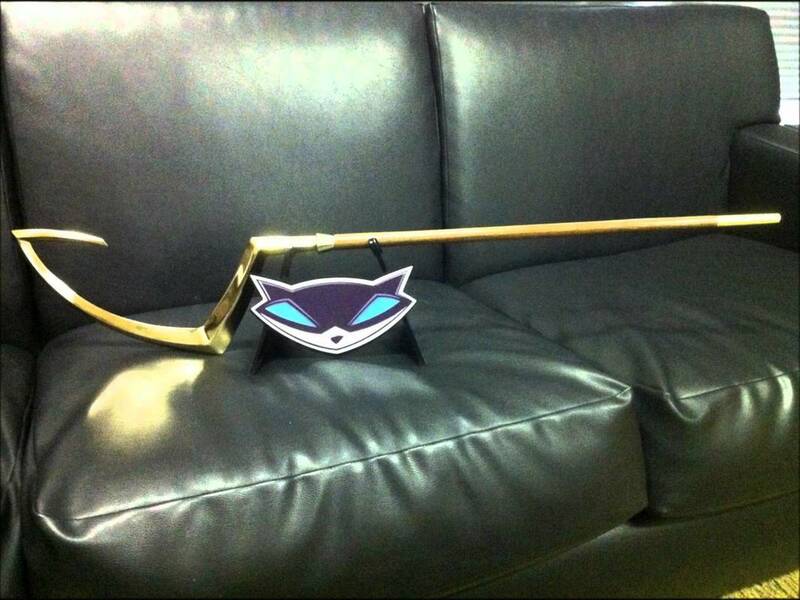 No, technically this is not a Sly Cooper item. However, it came with the collector's edition of a game created by Sucker Punch Productions, the studio that created the first three Sly games. 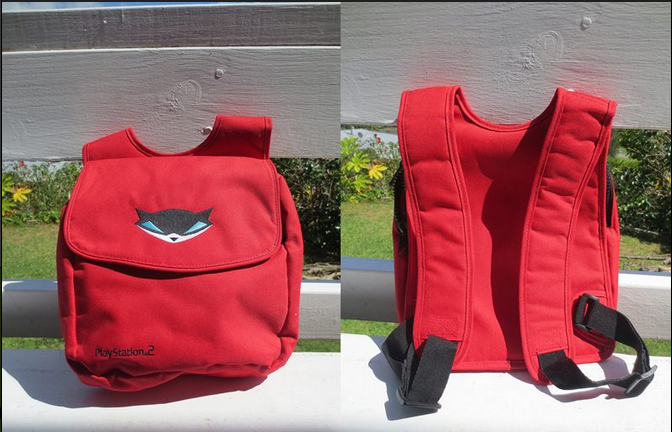 Also, the backpack is slightly similar in design to Sly's backpack from Sly Cooper and the Thieves Raccoonus (in color, anyway), and it sports the Sly Cooper logo. 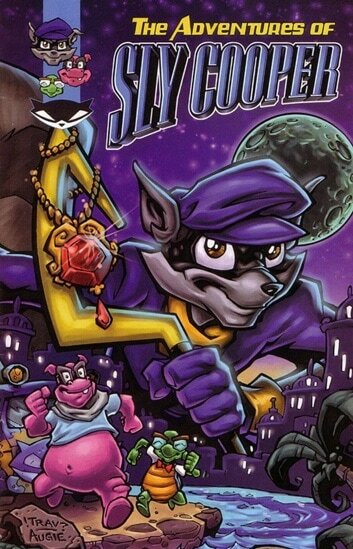 It's worth mentioning that the existence of this logo led many to believe that Sucker Punch wanted to assure fans they'd eventually return to the Sly Cooper series, making this a somewhat significant part of Cooper history. You can usually find the full collectors edition or just the backpack alone on Amazon and eBay. Related: See Sly Cooper and the Thievius Raccoonus backpack. 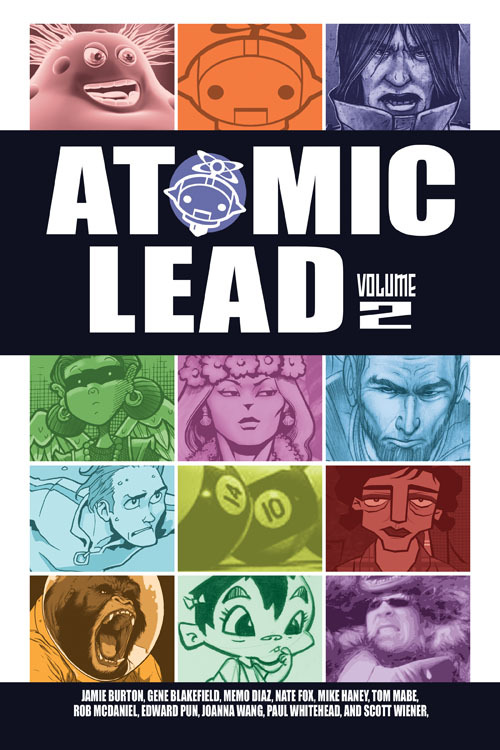 "An anthology put together by eleven artists from Sucker Punch Production. 56 pages, perfect bound, black and white interior pages with full color cover. ​Ever wonder what the folks at Sucker Punch do after work. Find out in this collection of comics and pinups by 11 SP artists. This book will have something for everyone from a wide variety of art styles and stories." 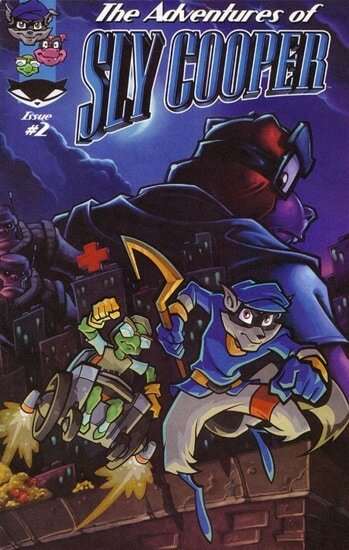 This is a comic book created by artists over at Sucker Punch Productions after the release of Sly 3: Honor Among Thieves. It was temporarily sold on the Sucker Punch online store before its closure around the time the first inFamous game was released. It isn't particularly rare and you should be able to find it on eBay, Amazon, or a comic book collecting website. 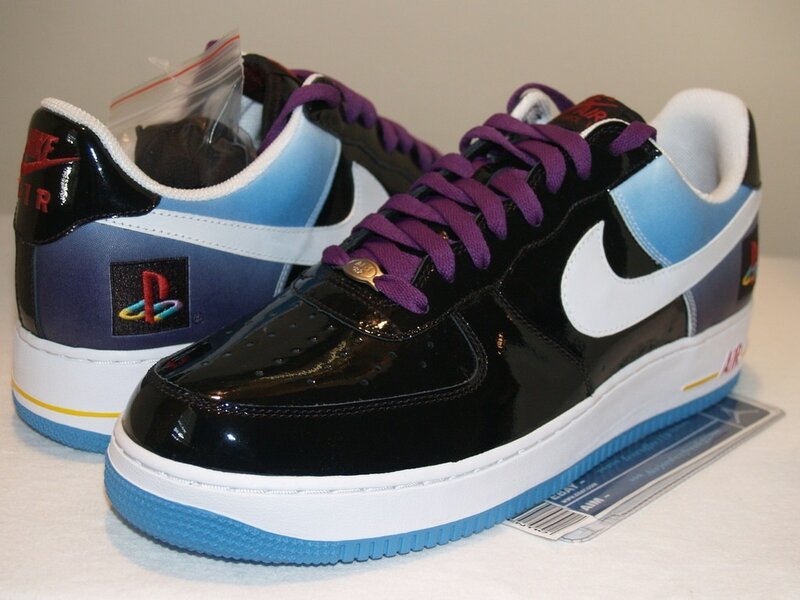 In 2006, Sony contracted Nike to release a special edition of shoes sporting the PlayStation logo. While these aren't technically Sly Cooper Merchandise, they are definitely in the right time period for the first three games. Unfortunately, these only saw a very limited release, making them extremely rare today. Depending on their condition, you can get them anywheres from $160 (unlikely) to $1,000 (more likely) and up to $5,000 (for great condition) on eBay. Game demos are pre-release versions of a video game which allow consumers or the press to get an early taste of a new hit. In the early days they were distributed on discs and given out at conventions like E3 or at stores like GameStop. Nowadays, they come as downloads from PSN, or they could be packaged with other related games. These demo discs were distributed by Sucker Punch Productions at E3 2002. 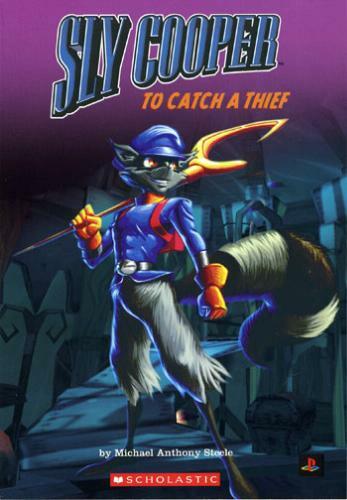 The disc contains early versions of levels from Sly Cooper and the Theivius Raccoonus with different dialogue, graphics, gameplay, and more. Sly's character model is even different, as he looks more serious and has a blue nose and mask! You can typically find these for resale on eBay but they are still relatively rare. If you don't want to try hunting down a copy, I ripped my disc and uploaded it as an .ISO file on the Downloads page. You can play it on a PlayStation 2 emulator like PCSX, or burn it to a disc to play on a modded PS2. Legal Note: I am not sure how legal this. If Sony or anyone has a problem with it I will remove it from this website immediately. 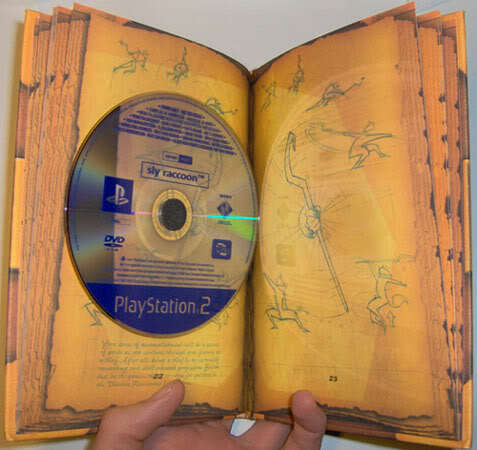 This was the demo disc for released ahead of the second installment of the Sly Cooper series in 2004. While I do have a copy, it's sealed and I don't know very much about it. As information become available, I'll add it here. You can typically find these for resale on eBay but they are still relatively rare. 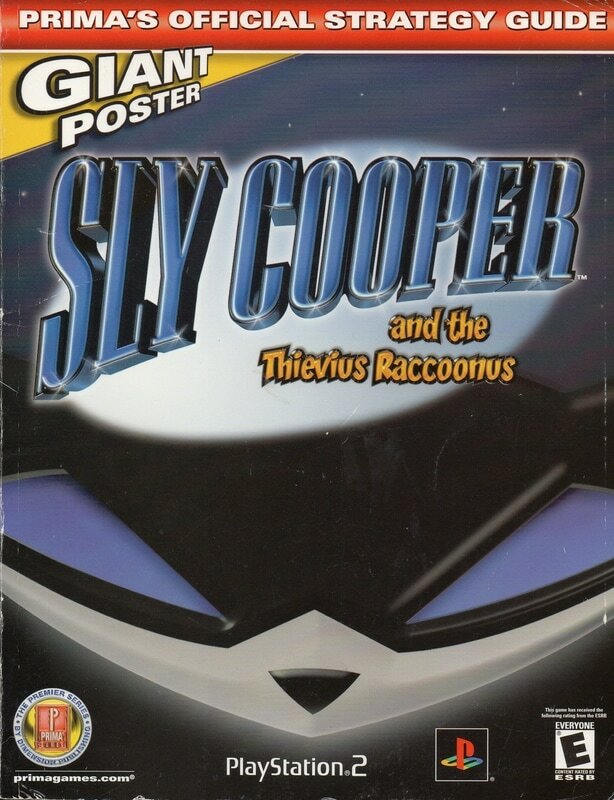 This was the demo disc for released ahead of the third installment of the Sly Cooper series in 2005. I don't have a copy of this demo, and I don't know very much about it. As information become available, I'll add it here. 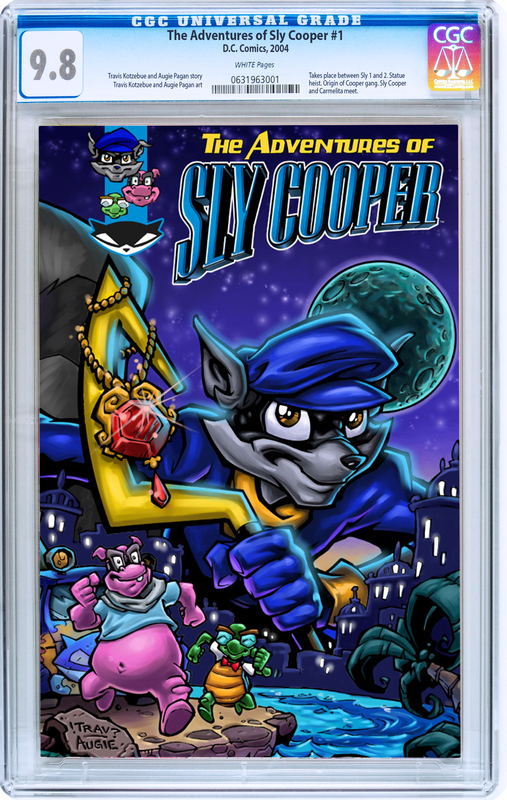 If you are lucky enough to own a copy of The Adventures of Sly Cooper, Issue 1 or 2, you probably want to take steps to archive, protect and preserve them. These comics used to be cheap enough, but in recent years they have become increasingly rare and much more expensive. Here are some products you can purchase to ensure that your comics stay in mint condition. Note: the information collected hear is based upon my own independent opinions and research. This comic book frame from Bags Unlimited is popular among comic collectors, and its what I use to protect and display both of my Sly Cooper comics. ​"These 100% archival frames are guaranteed safe for indefinite-term storage of your most valuable comics. The clear acrylic front sheet is 3/32" thick, conservation grade, and blocks 98% of harmful UV rays. The back protective mat is off-white, 0.040" thick, 100% alpha-cellulose board, buffered with 3% calcium carbonate, and certified by the Library of Congress for long-term storage. As an added value, we include a Melinex sheet that serves as an archival spacer between the acrylic and your comic, as well as a sheet of buffered, acid-free tissue that neutralizes migrating acids." The frame itself comes in both black aluminum and black wood variations. Make sure to select one that lists "New & Regular" (​ANCFK). Comic book grading is one of the best, most trusted ways of preserving a comic while establishing it's value. To have a book graded, you send it to CGC (Certified Guaranty Company, LLC). They'll then review the book, give it a grade based upon it's condition, and seal it in a CGC case. CGC cases are great because they're UV resistant, acid free, and super rigid. Unfortunately, there is one main downside. While you can certainly remove the comic book from the enclosure, you won't be able to seal it back inside of the case again without sending it back to be re-graded! 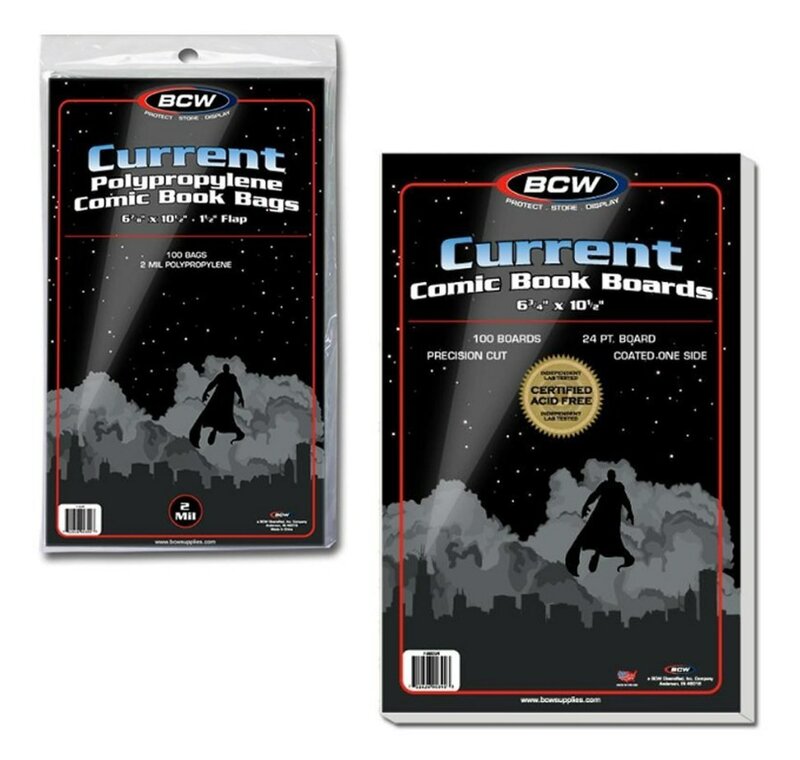 "Bagging and boarding" a comic is one of the most common methods fro protecting your books. You first place the the comic on an acid-free, sturdy piece of cardboard. This will add rigidity to the comic which will prevent accidental folding, rolling and creasing. Then you slide the comic, still on the board, into a plastic (polypropylene) bag. This will prevent it from abrasion, spilling, dust - you name it. You will also be able to easily remove the comic whenever you'd like. However, the main downsides of this method of preservation is that the bags are not UV proof, and you cannot display the a bagged comic without the use of a frame.